Giannis Antetokounmpo mural by Fred Kaems located at 3600 S. Clement Ave. Photo by Jeramey Jannene. It’s hard to define the term “superstar,” but Milwaukee Bucks forward Giannis Antetokounmpo clearly has reached that level. 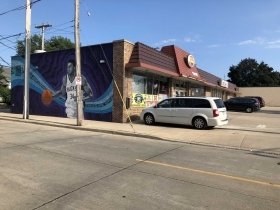 Case in point: Milwaukee resident Brendan Jones just paid out of his own pocket for a larger-than-life mural featuring the NBA All-Star to be painted on the side of a building across the street from his house. “When I was younger it was always cooler to go to other cities because there was more street art,” says Jones. 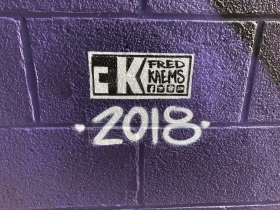 Thanks to Milwaukee-based artist Fred Kaems and 40 cans of high-quality spray paint, Jones, a native of Green Bay, merely has to look out his front windows today for that big city experience. What inspired him to commission the massive mural? “Ultimately I just wanted to do something nice for the neighborhood,” Jones tells Urban Milwaukee. You can find the mural in the city’s Tippecanoe neighborhood just south of Bay View. 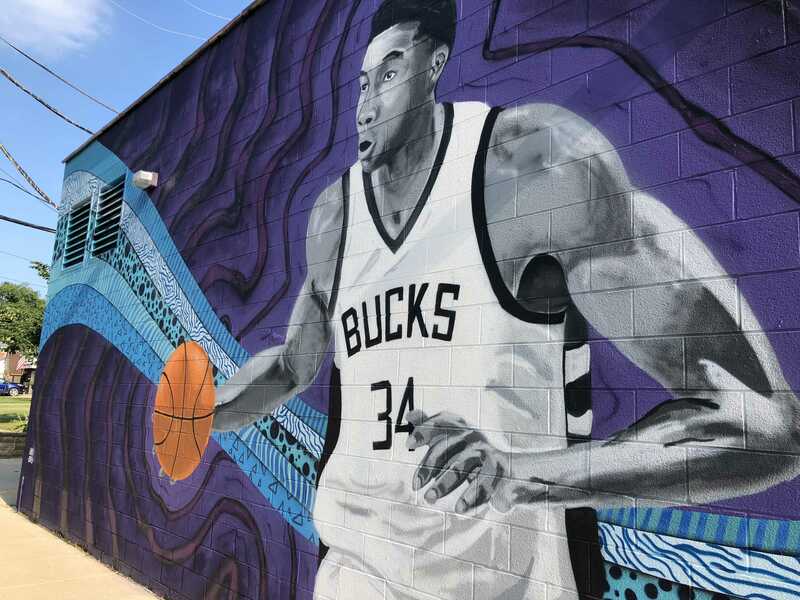 It’s painted on the north side of the Corner Market convenience store at 3600 S. Clement Ave. just east of the intersection of S. Clement Ave. and E. Warnimont Ave.
Jones is no stranger to Giannis’ ever-growing stat line. Jones’ job is producing in-game graphics for Fox Sports Wisconsin, including Milwaukee Bucks home games, as well as in film production. 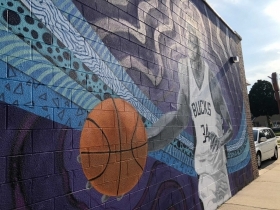 Jones didn’t seek out the Bucks’ or Antetokounmpo’s permission before commissioning the mural’s painting. “If your heart is in the right place, you won’t get in trouble,” he remarks optimistically. 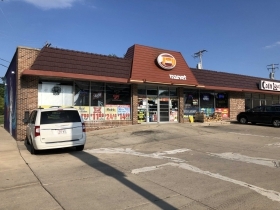 He did secure the permission of convenience store and building owner Lakhwinder Singh. The mural contains no words or brand symbols other than “Bucks” on Antetokounmpo’s jersey. The design is largely monochromatic to draw attention to the entire piece, says Jones. The mural is a stepping stone towards a bigger project for the filmmaker. 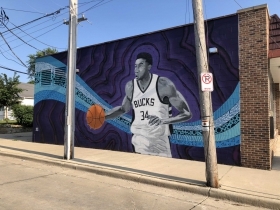 He worked out a trade arrangement where Kaems waived his fee to paint the mural and in turn will be featured in a short documentary Jones is producing about how athletes can influence art. Kaems, in a Facebook post, noted that it’s the largest-scaled portrait he’s ever painted. The filmmaker intends to visit Los Angeles and New York to film additional artists before debuting the film later this year. Jones has already filmed an interview with Inside the NBA co-host Kristen Ledlow for the short. Awesome post! I live in this neighborhood right on Brust Ave. Great job Brendan!